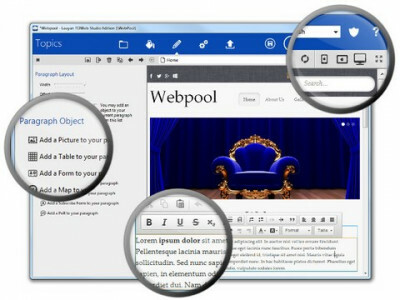 TOWeb 2.08 is wizards & components software developed by LAUYAN SOFTWARE. TOWeb is an easy-to-use software for persons and organizations wishing to quickly create a Blog or a Web Site without any web designing skills, without dealing with web programming stuff, without using a retouching software for their pictures and without being left alone in front of a blank page with dozens of options. This web development program is freeware, so you can download and use it absolutely free. TOWeb 2.08 supports different languages (including English, French). It works with Windows 98/XP/Vista. We have tested TOWeb 2.08 for spyware and adware modules. The software is absolutely safe to install. We has completely tested wizards & components software TOWeb 2.08 many times, written and published the interesting article and uploaded installation file (9328K) to our fast server. Downloading TOWeb 2.08 will take minute if you use fast ADSL connection.